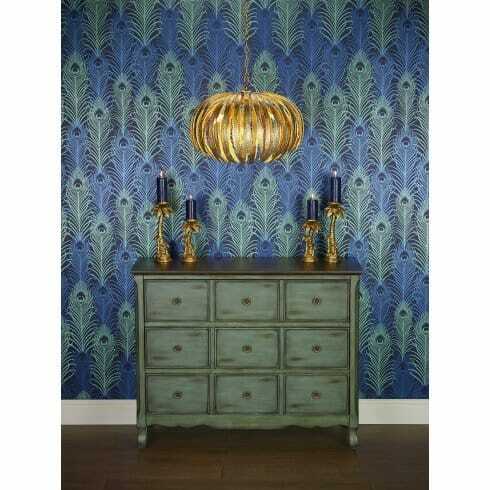 Dar Lighting Atticus 5 light ceiling pendant features a shroud of long leaves inspired by the style and spirit of classic antiquity. These decorations are embellished with a beautiful hand-crafted foil applique gold leaf, and when the fitting is illuminated warm light spills from between the leaves for a spectacular effect. The product code for this Dar ceiling pendant is ATT0535. A timeless design that would make a tasteful and artistic addition to any suitable room. Alternatively, please see our website for the full range of classic and contemporary pendants to suit your home.